One doesn't have to have a special camera, nor be a professional photographer. One does have to see. The idea proposed here is that we look and not excite ourselves with the notion of capture, but be still enough to recognize what is ready to be captured. Laid out in a series of exercises, this book leads one through ways of seeing. An exercise is suggested, then the authors or their students present their photos as examples of the exercise completed. The author stresses that these photos not be modified or arranged or designed--that their freshness is dependent upon lack of contrivance. A calm descends midway through the book, when we realize that there are an infinite number of perceptions to be captured. One just has to be still enough to see. The authors kindly guide us through the means by which we can make our equipment match our perception by our understanding the technical requirements of our camera. Most importantly we recognize that we all can see, if only we would. Debut novelist Cara Hoffman takes lots of liberties with our hearts--our fears, our uncertainties, and our repressed desires--in her 2011 novel So Much Pretty. Something happens, finally, in the rundown rural upstate New York town where a journalist slowly accumulates evidence of toxic poisoning by the "family-run" corporate-owned dairy farm that dominates the physical and personal landscape of the town. The town's residents, a little strange but vaguely familiar, are given voice through depositions and interviews recorded during and after an undetermined tragedy, the outline of which we slowly perceive. An unconventional chapter format moves the action forward and backward in time, and from person to person, slowly peeling back our notion of rural placidity to reveal the bloody carcass beneath. Let me be clear: I can not say I actually enjoyed this book. It was unsettling and disturbing, and we see ugly: sometimes human beings act to give individuals short-term gain at the expense of society's long-term health. It introduced us to folks willing to renounce that unequal equation only to confront it's inescapable impact on their lives anyway. But one can almost hear the hiss of insects in a sunny field, see the glint of sunlight on a cool stream, and feel the bump of butterflies on the walls of a hoop house when dispersed by excited children. These things the author gives us in compensation for the awful truth about two young, pretty, innocent swim team schoolgirls. Ooh, Peter Carey is a hooligan, a rough lad, a clever boy. He takes the opportunity this novel provides to lampoon the national character of France and America, though he went rather easier on the British and Australians. But what a send-up it is! Glorious with imagined scenes of snobbery and pomp in royalist France, and rife with grim scenes of those money-making (literally: counterfeiting) British printers, he moves a youngish Olivier, French aristocrat and lawyer, and his secrétaire, the former counterfeiter John Larrit (nicknamed Parrot), to America, ostensibly to investigate the state of American prisons. In America, Olivier had heard, prison management was trying something completely unprecedented: rehabilitation as opposed to life-long penitance. Modelled on Alexis de Tocqueville’s (short for Alexis-Charles-Henri Clérel de Tocqueville) chatty travelogue Democracy in America, Olivier de Garmont’s (full name Olivier-Jean-Baptiste de Clarel de Garmont) book of the same name will surely be the greatest book on the habits of new country yet written. Narrated in amusing voice by Humphrey Bower, Parrot and Olivier in America illustrates with broad swathes of the pen-as-sword, the industrious and plebian democratists making a country they can live in. The young women of this new country are deliciously uninhibited, and the young men have a romantic notion they can aspire to greatness. The aristocrat and his secretary are both irrevocably changed by their term in America, become friends, and learn to live as equals. 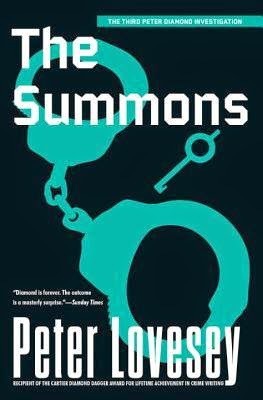 It is a journey both instructive and humorous, and we thank Peter Carey for turning his gimlet eye on our specificities. The Peter Diamond mystery series is a British classic. Diamond, former CID murder investigator, has had his knocks. He is still looking for work and is just considering working as an artists' model (!) when opportunity comes knocking. Diamond is proof positive that one can be very wrong about something important and still make a comeback, if we still needed to be reminded. Once again he has managed to claw his way back to the top of the heap, though one cannot help but wonder how long he'll last. He doesn't always make friends on the way up--in fact he manages to alienate just about everybody. I was just getting used to his switching jobs every couple of months, and here he is...but that would be telling. A busker is kidnapped by an escaped convict, and the kidnapper is willing to negotiate, but only with Diamond. Called back by his old bosses, he sets up an alternate office and investigates an old crime in order to defuse the new one. He manages, sliding into home just as the clock strikes. It is a wonderful finale...heart-poundingly, nail-bitingly close. I love seeing how writers manage to ratchet up the tension level. Maj Sjowall's Roseanna went from zero to sixty in a matter of sentences in the last few pages, making it the book to beat when seeking an example of "breathtaking." This bitingly funny and sharply observed debut novel is romantic comedy set within the context of lightly-handled larger social issues: the meaning of community and the changing nature and strength of family relationships; the development and preservation of ancient country lands; religious and racial prejudice and discrimination and its ruinous consequences. Set in a small village in England's Sussex county, the action centers around the lives of Major Pettigrew of the Royal Sussex, retired; his son Roger, banker and London resident; and Mrs. Jasmina Ali, a British born-and-bred shopkeeper of Pakistani descent. Eventually the whole village is hilariously paraded in cariacature, including two visiting Americans. Edgecombe St. Mary, and Hazelbourne by Sea are so lovingly sketched that I went in search of photos only to discover that Simonson's portraits of the fictional seaside town closely resemble Eastbourne in East Sussex and that it may be the Beachy Head Cliffs that is the site of the book's critical mise-en-scène. Simonson has done a remarkable job of balancing humor and social criticism. Major Pettigrew might even be said to personify that balance, which is why we like him so much. He has some heft, but carries himself lightly. Helen Simonson's website can be found here. The name Jim Kelly sounds American to me, in a way that the Australian name Ned Kelly does not. But author Jim Kelly is British, and in the tradition of the finest British mystery writers, he has produced a mystery worthy of a series with Death wore White. The descriptions of the two lead investigators on a triple homicide are strong and fully-fleshed, containing those rogue contradictions in character that make the action realistic, and interesting. Other characters are quickly sketched but contain the essence of personality and form. The author uses words the way his youthful Detective Inspector Shaw uses his Forensic Art kit, constructing faces, lives, motives from the heap of choices that surround us. Death wore White is complicated, and filled with the feints and weaves that a complex set of family relationships can throw at someone observing from the outside. But the coast of Britain in winter, protected by Her Majesty’s Finest, is a fine place to observe the insecurities and failures of the most well-meaning, and the unexpected strengths and grace of the least among us. What I liked best, I think, was the ending. The straight up-and-down by-the-book young DI does something that might seem out of character for him, but not for his partner DS Valentine, nor for his dead and discredited father. So we look forward to the next development in the series. I was completely charmed by this unexpected fairy tale of a novel which tells of a young stowaway in a rug-seller's trunk who travels by boat to Stamboul, the city at the intersection of Europe and Asia. Stamboul is a city shrouded in mystery & incense, colored with bazaars & sunsets, and clamorous with music & many tongues. It may be universal that children, unfettered as they are by knowledge of the world, nourish the seed of hope that they might be discovered to possess unusual skills or talents, or that they be discovered to be gifted, or beautiful beyond compare. I remember that wonderful dream myself; the softness of the velvets surrounding me, the sweetness of the fruits given me, the brillance of the ribbons decorating my clothes and hair. No matter that my life was nothing of the sort. This novel has the flavor of an old fairy tale but with an indescribable freshness that makes even a world-weary curmudgeon remember days breaking bright and fresh with possibility and fantasy. The descriptions play to the western mind, wreathed as they are in eastern mystery and intrigue. The unencumbered ending was as suprising and unexpected as were the revelations carefully unfolded in preceding chapters. We feel something, and it is wistfulness. This book is entirely suitable for readers from age 12. It is especially recommended for those who think they are too old for fairy tales. Craig Johnson's books, read by George Guidall, have something of the wise old dad about them. No matter that Walt Longmire, sheriff of Wyoming's Absaroka County, is not so old he doesn't lust after his deputy, the apple-assed Vic Moretti. That just makes him more of a man. And man he is. Bearing all manner of physical insult, he comes out on top once again, chasing his quarry through an 18" snowstorm high in the hills surrounding Red Lodge, Montana. The ridiculous nature of the events that set off a chain of murders can only be based in truth because no novelist would create such stories for fear his tribe of readers would leave him for dead. In interviews Johnson tells us that he gets the basis for his outrageous stories from his friends in the police, so the one about the man cleaning the chimney in the middle of the winter with a rag soaked in kerosene, and tied with a rope to the bumper of a Durango, has got to be true. Hard as it is to believe. But it is the home-smoked flavor of these great western stories that make this series so...home grown. This is a series I allow myself to savor like a fine cigar. I pace myself, withholding the pleasure of beginning a new story until I feel I have earned a special treat. They are soothing to the soul, funny to the bone, candy for the brain, and oh-so-reassuring for those among us who fear wisdom eludes our public servants.